For residents in Phoenix Auto Electrical repair can take many forms. As a generality, it is important to remember that more and more of your vehicle systems are dependent on electricity, so making sure that the car electrical systems remain in good condition, and good repair. In fact, auto electrical service is responsible for everything from starting your vehicle, to rolling up your windows and remotely unlocking the door. Though some of these things may seem like luxuries, others are simply impossible to ignore when they aren’t working properly. At Tucker Tire and Auto, we want our customers to have the confidence to fully rely on their vehicle, regardless of the situation. We have put together a few of the most important things to look out for when attending to auto electrical repair. If you pay attention to these things, you can expect that your vehicle will behave exactly as you anticipate. Battery – Making sure that your battery is in good condition is possibly the best starting point when it comes to auto electrical problems. Anything from low voltage to a faulty alternator can affect first your battery, then the electrical systems of your vehicle. Before replacing your battery, we suggest some preliminary troubleshooting to ensure that your money is well spent, and the issue is resolved. Alternator – the Alternator is what allows the battery to recharge while you drive; this is important because otherwise, you would only be able to start your vehicle perhaps 12 times before it was time to purchase another. If the alternator has failed, you will find yourself unable to start your vehicle in very short order. Blown Fuse – a blown fuse can cause all manner of seemingly mysterious issues. Thankfully, replacing a fuse is often a simple matter of identifying the fuse and providing the correct replacement. These kinds of repairs are most often simple and quick. Wiring – These kinds of repairs are easily the most expensive kind of issues to encounter. In some cases only several hours of troubleshooting can find the source of the issue and make the necessary repair. Luckily, the necessity for this kind of repair is rare, but it is the skill of our technicians alone that allows us to make these repairs faster, and with less cost to you. At Tucker Tire and Auto, we take great pride in the fact that our technicians have received the best training and retain certifications from the ASE. This means that our technicians have the knowledge and skills necessary to make sure that your vehicle gets the care it needs in a timely, professional fashion. 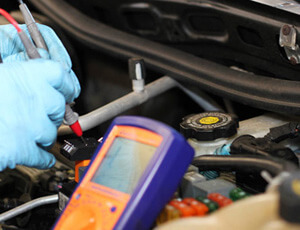 We invite you to contact us if you have any questions about vehicle electrical problems. We will be glad to help you in any way that we can, and give you the information that you need.